Multigenerational home designs, environment-friendly innovations, and traditional American architectural styles combine to create the quintessential California community. Beacon Park, a1,029-home community in Irvine, California, represents site-level adaptive reuse at its grandest scale. It took this year’s Best in American Living Platinum award for Best Community, 100 unit or more. The neighborhoods, park, future mixed-use sites, and nearby transit access are woven together by biking and walking paths, heritage trees, and complementary home designs based on traditional American architecture. To encourage residents to use these bike paths, every new homeowner receives a custom orange bicycle when they move in. Beacon Park features an abundance of environmentally friendly designs and innovations. Some builders offer roof-mounted solar panels, which owners can either buy outright, or merely use to receive a 20 percent power company discount guaranteed for 20 years. Many of the homes feature tankless water heaters. And the streets are narrow by design—both to reduce impervious surface and slow traffic speeds. All medians and parkways in the community use recycled water and replace turf grass with low-water use plants and drip irrigation systems. Home designs in Beacon Park—created by ten different builders—combine an eclectic mix of influences spanning many regions and generations. Designed to meet the needs of every member of the community at every stage of life, they include condominiums, fourplexes, triplexes, motor courts, townhomes and single-family homes, and range from 1,465 square feet to 4,600 square feet. Like an older neighborhood that has evolved over years, Beacon Park has a less-planned, more organic look and feel. Three-story townhomes are interspersed among one- and two-story single-family homes, most of which are designed to house multiple generations under one roof. Multigenerational design is actually a feature offered as an option in many of the community’s 47 model homes. Lennar’s Rowland collection, for example, offers an optional third-bedroom on the first floor in three of its four plans. The Primrose collection from D.R. Horton offers both a first-floor junior suite as well as an option to convert the upstairs loft into a fourth bedroom. This plan can accommodate aging parents, children, and grandchildren all under one roof. Beacon Park offers homes for every buyer segment. For example, the Brio Collection by Shea Homes appeals not just to young families but also empty nesters, and the Harper Collection from Lennar is designed for both young professionals and move-up buyers. The community will include two brand new schools—one K-8 and one high school. And the community’s sister, Pavilion Park, features a new affordable housing community for active adults, offering yet another opportunity for residents age 55+ to live near children and grandchildren. The neighborhood’s classic architecture, pedestrian focus, and abundant open space and amenities create the quintessential California community. A 5.6-acre park at the heart of the neighborhood functions like a classic small-town village green. This park begins at the Meeting House—an open, engaging arrival point that immediately demonstrates Beacon Park’s walkable, friendly and creatively connected place. Inside, multi-functional spaces will serve the community for special events, private parties and everyday enjoyment. Radiating from the Meeting House is a sequential array of structured and open-air elements designed for sports and recreation, leisure enjoyment, and social activity. Conceived as a series of delightful discovery points, they surpass the expected playground, pool and barbecue area by incorporating sports and bocce ball courts, an arts house, and a pool house with lounge. Overlooking it all is a freestanding “tree house,” so-named because it’s flanked by preserved jacarandas. The “tree house” offers a commanding view of the park and is enjoyed by parents and children alike. All of these amenities appeal to diverse ages, abilities, and sensibilities. Every aspect of Beacon Park displays thoughtful planning that promises to enrich the lives of all members of the community. 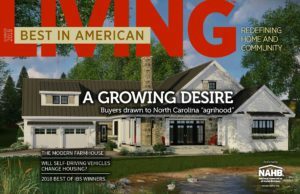 Original article, written by Claire Worshtil, was featured in the Summer 2016 issue of Best in American Living.